Have you heard the frog calls that sound like ducks quacking quietly from the vernal pools? Wood frog calls sound like ducks quacking, but their calls lack the volume of the cacophonous peeping of spring peepers. .... wood frogs are very, very shy and they keep quiet if a visitor arrives at the pool. They will, however, slowly float over to see who came to visit them if you hold still long enough. If you have alot of patience and sneak up to the pool, you can watch as the wood frogs call and chase each other. 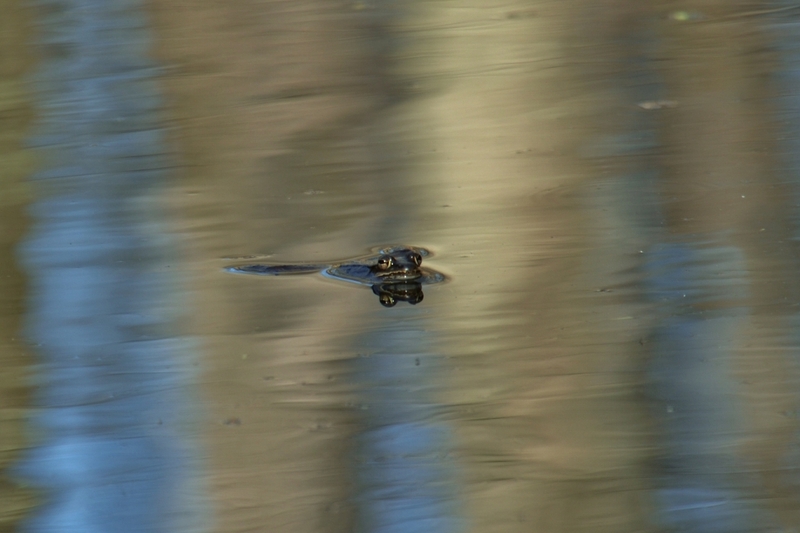 Wood frogs call from the surface of the water. 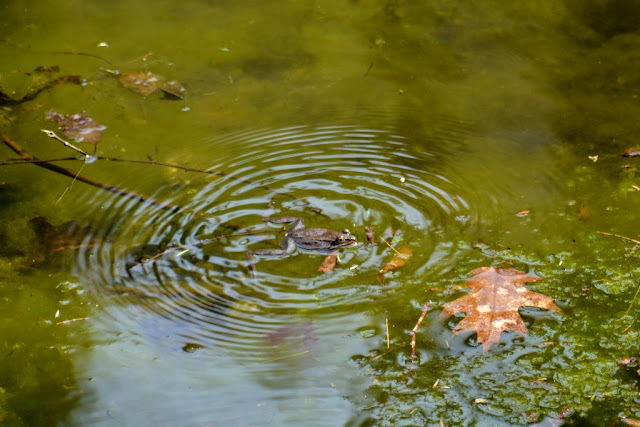 When they croak, a circle of waves spreads out from each frog. 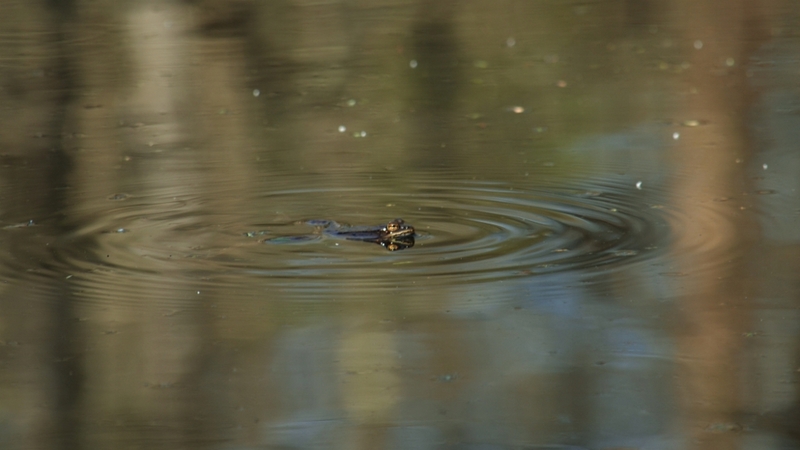 Here is a photo of a wood frog and the spreading ripples immediately after the frog said, "quack". My guess is that those ripples are also part of the frogs communication. What do you think? The wood frogs have come down out of the forest to meet up and lay eggs in the vernal pools, just like the Yellow-spotted Salamanders. I should say, the wood frogs have been doing a good bit of croaking and quacking, but the salamanders are always quiet about their visits. I suppose it's hard to watch and listen to croaking wood frogs with still images and no audio, so check out my next post... 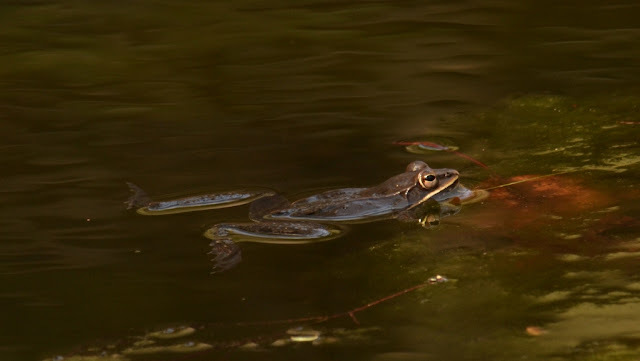 I'll post some video of wood frogs quacking from the vernal pool. Heard the Peepers two days ago for the first time this year. We have a boggy wood at the end of our street, so I can hear then in the evening by just stepping out my door. Love that sound ! Not sure if I've heard a Wood Frog. Looking forward to the sound file.